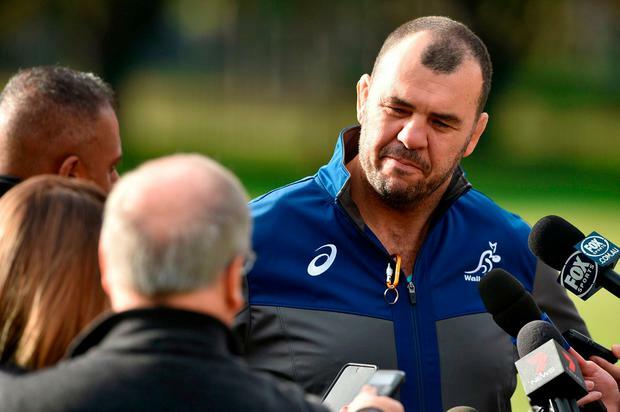 Australia head coach Michael Cheika has called on his players to counter Ireland's attempts to frustrate them ahead of Saturday's deciding Test at Allianz Stadium in Sydney. Cheika has bolstered his lineout with the selection of Lukhan Tui at blindside flanker. The inclusion of Tui, who has played three of his six tests at lock, sees David Pocock shift from the number six jersey back to number eight, with Caleb Timu dropping out of the 23-man match day squad altogether. Captain Michael Hooper remains as openside flanker. Lock Adam Coleman has also been retained despite being forced off last week by a head clash with team mate Israel Folau which Cheika initially thought had resulted in a fractured cheekbone or eye socket. Blindside flanker Ned Hanigan has been brought back into the replacements bench after recovering from a knee injury, with Pete Samu also providing cover in the loose forwards. Nick Phipps has been promoted from the bench to replace the injured Will Genia, who broke his right arm in last week's 26-21 loss in Melbourne. Cheika believes the team that adapts best from what they've learned in the opening two Tests will prevail in Saturday's finale. “It's more about how you adapt as the series goes on and sort of things, because you do get to know the other team pretty quickly when you're going back to back and then obviously three games in a row,” he said. “At the end of the day, the same sort of principles apply don't they? The Australian boss accused Ireland of slowing down the ball at ruck time and using blocking tactics to nullify the aerial threat of Folau. “I just had a look at the (Ireland) team then,” he said. “They're always going to bring physicality - you see how they do that thing where they get the two players connected beforehand and they try to ram you one through the other and they've been good because they're big and strong and they've been tackling, folding in, rolling in the way because they want to slow our ball down. “So, you need a physical presence to be able to do that and we've just got to get there before them. “We've got to not let them there and if they're there, we've got to get them out of the way with whatever means we need." Cheika thinks more accurate kicking will be the key to getting Folau into the game. "We've got a few different things that we might look at, for sure,” he added. "But we can counter the blocking and everything like that with better kicks. The concession of soft penalties has been a big issue for the Wallabies but Cheika is predicting a marked improvement on that this weekend. “We’re working on it hard, even with our off-field stuff and getting an understanding from the referees of exactly what they’re looking for and making sure we’re relaying that correctly. Just little things,” he said.